Pac Cup Update: Day 11+ FINISHED! 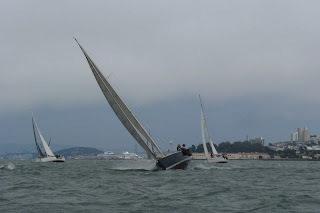 This post is from Barry, sitting at J/World’s office in Alameda over 2,100 nautical miles from the Kaneohe Bay Yacht Club and the Pacific Cup finish. Having competed in several ocean races such as this, I’m sure the team had every intent to get “one last” post out. However, as they approached landfall and the pinnacle of their adventure, I’m sure they attended to other things and the many mixed emotions ranging from “I can’t wait to get off this boat” to “I can’t believe it’s over already.” There will be tales to be told to friends and love ones – those meeting the team in Hawaii and those back home and at work. Sailing a boat across an ocean is no small feat. RACING across an ocean is an even greater accomplishment. The J/World team consisted of 2 coaches and 6 participants and most had never met until just before the start of the race. Most of our participants had little – if any – offshore experience – but they do now! Congratulations to all of our participants for their accomplishment. Thank also to Nick White who made it possible for us to introduce our participants to Expedition – the best tactical and navigation software available. Expedition supports more instrument systems, is easier to use and has the most powerful and useful functions for the racing navigator. Thank you Peter Cameron and Cameron International for last minute trouble-shooting and help in sorting our our instruments. Most importantly, thank you to the friends and families of our team who support our dreams and aspirations! http://sailing-jworld.com/jworldwp/wp-content/uploads/2015/01/Header-Logo.gif 0 0 jworld http://sailing-jworld.com/jworldwp/wp-content/uploads/2015/01/Header-Logo.gif jworld2008-07-28 20:53:002015-01-05 20:03:56Pac Cup Update: Day 11+ FINISHED! So on the wee morning hours on Wednesday, still some 900 miles from Hawaii, a mishap in the darkness led us to rip our last big chute. Big rip. Basically blew two long tears along two of the three edges. Ouch. We pulled out each of the damaged sails, and determined that none of them could be fixed with any degree of certainty. So off we went with a smaller, heavier kite, and we set out looking for squalls and the stronger winds they bring! We managed to hook into a couple of fun ones, seeing winds to almost 30 knots, and the hunt continues. It;s a bit more difficult at night to see them coming and line ourselves up with them, but we are managing ok. Also, we are deeper in the trade winds so the breezes are a bit stronger in general, and the team has taken too racing this like a leg (a LONG leg!) of a buoy race: we are watching each shift and gybing as much as necessary to always keep on the favored gybe. We think this aggressive sailing is going to be the only way we can keep up with the rest of our fleet, and even so it’s going to be a tough battle. It will be interesting to see in this mornings roll call how we have managed. Even just sticking with the other boats will be quite an accomplishment. Anyhow, the sailing is spectacular now. Right around midnight each evening, a big moon rises in our wake. Throughout the evening it works its way ever higher into the sky, lighting up the sea and the tropical cloud formations. Ron’s driving at the moment (graveyard shift, 4:30am), with Tanya on trim. We have a little over 15 knots, and are running along at around 8 knots… I’m down below, just having pulled down weather, doing a bit of nav-a-guessing, and occasionally sticking my head out the companionway to remind them to “bear away… stop going so fast/high! Hawaii is over THERE!” Seems like the eternal job of a navigator. We’ve had only a couple of squid and flying fish come aboard as unfortunate hitchhikers. Today we were accompanied a couple of times by big schools of large fish, guessing tuna. Pretty cool. And the company aboard is great. Since we have a chemist, a couple of doctors, and other various participants much smarter than ourselves, the big discussion today revolved around the possibility of developing dehydrated beer. Despite being told it’s impossible, John remains hopeful that breakthroughs will someday make it possible. A boy can dream, no? Anyway, we’ll give an update once we hear the morning position reports… keeping our fingers crossed that we have been able to keep in touch with the fleet! So, we passed the halfway mark this morning. We are now closer to Hawaii than pretty much anywhere else. And we are farther from terra-firma (good ol’ dry land) than you are anywhere else on the planet. The weather is now nice and warm, and the water is an amazing shade of blue. Wow. In the trades… sailing almost due west. A significant bit lighter than we had hoped, but so it goes. The breeze has been unstable, and we have been taking advantage of any right shifts to gybe to port in an effort to work south where we expect there to be a bit more breeze. Each morning at 9:00 am Pacific Time, every boat in the fleet has to check in with the race committee by reporting thier latitude and longitude. This ‘roll-call’ is a great time to check in with the fleet and see how we are doing, and how all our friends and competition seem to be faring. At this mornings check-in, we found that a reasonable number of our fleet have pushed south as well, and there is a good cluster of boats around us. In fact, we now have a couple of boats in sight (yet to be identified), so it feels a bit more like a yacht race again! Our crew work has gotten smoother and smoother, and we are now sailing the boat really well. It’s clear that everyone is getting more comfortable with the J/120 and we expect our upward trend to continue!Anyhow, that’s the latest from out here, about as much the ‘middle of nowhere’ as anywhere in the world. A bit crowded at the moment (relative to the norm, at least), but the company is great! 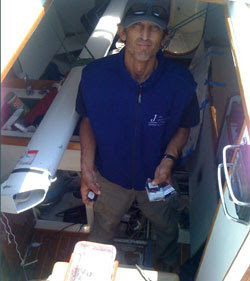 As we tick off the miles towards Hawaii and shed the layers of foul weather gear, the team is really getting stronger. I knew from the outset that our performance in the event would largely depend on downwind driving. It’s pretty tough to get good at offshore downwind driving except by doing it, and the group here has been racking up the experience, and it shows. The toughest thing so far has actually been the nighttime cloud cover. We have a nice full moon, but it isn’t able to get thru the thick clouds, so the evenings are extremely dark. Driving with the spin up in total darkness has forced us to drop the kite one evening, and last night we had our first casualty we blew up a a chute at about 11PM. It’s way too early in the race to be losing sails, and I don’t think I have enough tape and thread to get this one back together! So we learn from our mistakes and go on. We’ll have to throttle back a bit more in the evenings, but it’s better than taking ourselves out of the race. And right now it looks like the conditions might actually cooperate, keeping things in the sub 15 knot range while our gang gains experience and we look for moonbeams to guide us! Our J World Team continues across the Pacific, bound for Hawaii, in the 2008 Pacific Cup. Good mileage was ticked off on Friday, and into the evening as solid broad reaching conditions in 18-24 knots continued. Unfortunately, spinnaker wows plagued us after dark, and we were forced to drop the chute near midnight. In the morning radio check in, we found that reducing sail area at night had certainly cost us relative to some of our competition… but we got the kite up again in the morning, and had a brilliant day. It’s been nice broad reaching in 16-22 knots, with the wind starting to veer a bit and drive us more westward than southward. A fabulous Beef Stroganoff dinner (with sides of beef jerky and Pringles), and we were sailing into the night… but alas, the combination of darkness and spinnaker continues to be our nemesis, and about 1am we blew up our spinnaker. We got her down in a couple of big pieces, so we’ll take a look in the morning to see what can be done, but for now we are back to jib reaching. Time to let everyone get some much needed rest, and get charged for their next round! The question we are all asking is how are we going to find these tiny islands out here in the middle of this vast ocean? The answer is that we turn on our stereo and have it scan the am and fm stations. When we start hearing ukulele music we know we are close and we should start looking. To my family and all of my buddies at Sequoia YC, Coyote Pt YC, South Beach YC, Spinnaker Sailing Redwood City, The Waterbabies and the crew of Black Sheep. This is the great adventure. It was a thrill to lead the division through the golden gate. We hope to finish in the same fashion. Except for 48 hrs of sea sickness, everything has been great.This is a great crew and we are having Big Fun. http://sailing-jworld.com/jworldwp/wp-content/uploads/2015/01/Header-Logo.gif 0 0 jworld http://sailing-jworld.com/jworldwp/wp-content/uploads/2015/01/Header-Logo.gif jworld2008-07-20 04:07:002015-01-05 20:05:31Great Adventure! Well, as the morning arrives on this third day of the Pacific Cup, we are starting to feel the joy. But it wasn’t always like this. Wednesday afternoon, shortly after 2pm, team J World charged across the starting line in front of the St. Francis Yacht Club. 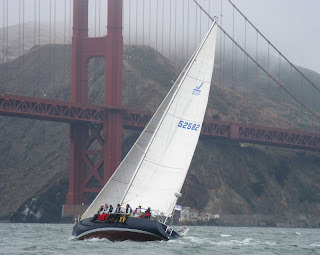 A good starboard end start and an early tack out into the building flood had us leading our fleet under the Golden Gate into a 20+ knot westerly. Once outside, we changed up to the #1 job expecting it to lighten a bit. The breeze backed off a bit, but by the time we were at the Farallones it had come on again, but it has also shifted around to the north a bit, so we eased the sheets, pressed the bow down, and said goodbye to (not so) sunny California. By evening, the winds had built a bit, and the seas were quite lumpy. We throttled back and changed back to the #3, and rolled into the first night. Confused seas and some unrelenting breezes made it a tough night, and day two saw similar conditions until the later afternoon. But then, as if on cue, the wind eased down below the 20 knot mark, and began veering, so with sheets eased we charged into the second night with a much more comfortable situation. At this morning’s radio check in, we discovered that a couple of our fleet are close by, but we still haven’t bee able to spot them. But they are too close for our liking, so with the wind getting farther behind is, we were able to get the spinnaker up, and now we are surfing along under mostly cloudy skies at about 8-12 knots. Yes indeed. Pacific Cup Update #1 – Ready to roll! I am happy to report that all of our pre-race preparations are complete, and we are pretty much ready for the race to Hawaii. With the utter chaos of preparations behind us (yea! see the look of desperation on my face?? ), we now are free to focus on the racing. We just wrapped up a practice session, ironed out the last kinks, and distributed some swanky looking crew gear. We have a truly great team who seem to have gelled right away, and the weather is looking like it is changing for the better, a trend which will hopefully continue until our departure on Wednesday at 2pm. We have a highly competitive fleet we’ll be heading out with, including some quick boats and some great sailors, so we have our work cut out for us. The next update will probably be sent in sometime Wednesday evening, so definitely check back in… and wish us luck! http://sailing-jworld.com/jworldwp/wp-content/uploads/2015/01/Header-Logo.gif 0 0 jworld http://sailing-jworld.com/jworldwp/wp-content/uploads/2015/01/Header-Logo.gif jworld2008-07-15 01:41:002015-01-05 20:05:41Pacific Cup Update #1 - Ready to roll!